What are the worst parts about going to the doctor’s office? It depends on who you ask. For some people, it is getting shots. For others, it might be stepping on a scale or having your blood pressure checked. One common complaint is the waiting. Too often when you arrive at a doctor’s office, the receptionists are busy with other patients and you have to wait. When you finally get a chance to speak with the receptionist, there are forms to fill out. 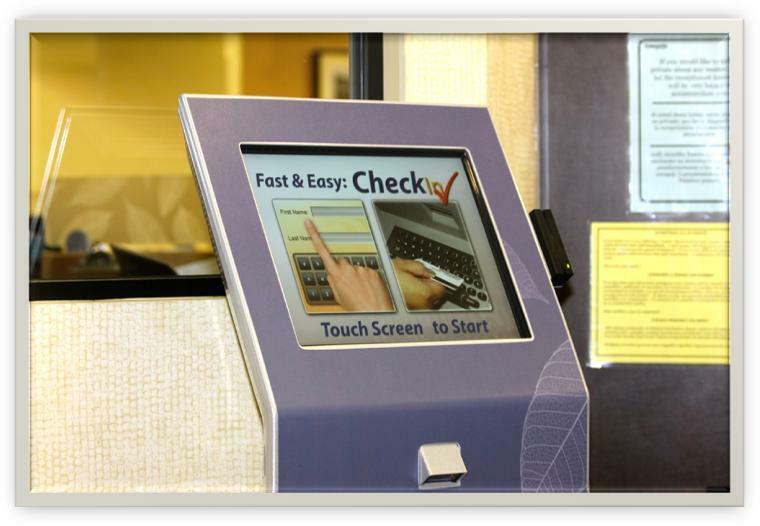 Some hospitals have introduced patient check-in kiosks to alleviate some of the wait, and CHC is now testing a new patient check-in kiosk at our New Britain site. When a patient arrives, they can enter their name and date of birth into to kiosk to check in. They are then given the opportunity to update information and to check off consent forms. If there are particular issues that need to be addressed, they are told to see the receptionist. Otherwise, they’re checked in. It is also possible to scan a Connecticut State Drivers license to check in. Besides decreasing wait times, this should help records be more accurate, especially when we have patients with similar names. Considerable time and effort has gone into designing the kiosks so that they look good and work well in our setting. They are being configured for English, Spanish and Polish. Already plenty of ideas have been uncovered in terms of how to make the kiosks even more beneficial. As we become more comfortable with the kiosks, additional kiosks will be added around CHC.